Nowadays, Siem Reap offers a wide range of restaurants, pubs, hotels and dozens of budget guesthouses. Siem Reap is full of amazingly good restaurants, serving cuisines from all over the world. There are far more good restaurants than one could reasonably try in a typical stay. Most of the good restaurants are around the Old Market, so you'll just have to walk around to find them. Champey Restaurant: A traditional Khmer Cuisine, dishes prepared according to the Royal Family recipes and western standard of service. Opposite of the French colonial old market or along the small streets called “the passage”, on the first floor for more privacy, or in the air-conditioned VIP Room, Feel free to sit down and relax! 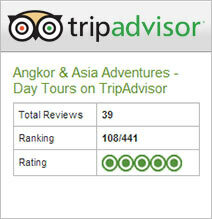 Amok Restaurant: “The Best Amok in Siem Reap”! Amok is an Authentic Khmer and national dish of the country. Located in the heart of the ancient French colonial old market district between Pub Street and Phsar Chas, Amok restaurant made a specialty of this Khmer flat, that it accommodates according to various recipes, on base of fish, beef, chicken, or simply vegetarian. Cambodian BBQ: A Fusion, warm, cozy and comfortable atmosphere to enjoy one of the most typical dishes of the Khmer gastronomy; the Phnom Pleung !! (Hill of fire). They serve exotic grilled meats of Snake, crocodile, ostrich, chicken or beef. The perfect place to discover new sensations and to enjoy a perfect moment with your family or friends! Casual and cozy, “Bon Appétit” has been a long time favorite for “Brunch”, afternoon snacks and dinner. They served Khmer food, Western food, tapas, dessert and exotic delicacies such as: Crocodile burger, crocodile skewer and crocodile stake. And for the drinks, they served fruit juices, coffee, tea, cocktail, alcohol and non-alcohol drinks. Blue Pumpkin: Café - Has an extensive food menu of pasta, salads, sandwiches and burgers, but all reports are the food is nothing great. What recommends Blue Pumpkin are their excellent baked items and home made gelato. Great for a late night snack or light breakfast. Has three locations: The Old Market. Soup Dragon: Khmer, Vietnamese & Western - Another good place for inexpensive food. Has a second floor to get you up away from the street, but with a good view of what's going on. Located on "Pub Street" a block up from the old market. Viroth's Restaurant: Khmer-Cool Asian contemporary outdoor garden restaurant on Wat Bo Street. Serves the most amazingly delicious Khmer cuisine. Prices are quite reasonable, especially given the excellence of the food. Main dishes (eaten 'family style') are around US$ 4. Expect to pay around US$ 10 per person, not including alcohol. On Wat Bo Street behind La Residence Hotel. Open for lunch and dinner. Brilliant new addition to the Old Market area. Subtle, temple-inspired design and decor. Authentic Royal Khmer cuisine, delicately prepared using local and organic ingredients and presented with panache, at very reasonable prices. Local beers and a cocktail bar serving original creations. A/C and curbside seating. Modern Khmer music, videos and dancing after 9PM. Great place to try your hand at Khmer-style dancing.